VanAntwerp Attorneys, LLP, is one of the largest and most historic firms based in Eastern Kentucky. Founded in the 1920s, individuals and businesses look to our firm to provide efficient and effective legal solutions. Our longstanding tradition of hard work and superior legal representation has allowed us to attract some of the best attorneys throughout the state of Kentucky. Our knowledgeable and experienced team provides exceptional representation in complicated, diverse and niche legal disciplines. Our attorneys have extensive experience representing clients in state and federal court throughout Kentucky and in Ohio and West Virginia. Our lawyers are deeply rooted in the local community. Many were born and raised in Kentucky. They pride themselves on providing excellent legal services and their commitment to the community. The firm places significant value on the support and effort its attorneys provide to local nonprofit and community organizations. Please consult our lawyers’ individual profiles below to learn more about their experience and credentials. We offer the experience and skill often reserved to large metropolitan-based law firms, in a local, attentive and client-focused environment. To meet with one of our attorneys, please call 606-618-0698 or contact our firm online. 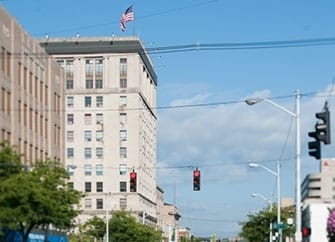 Our office is in the Community Trust Bank building in downtown Ashland, Kentucky.